The problem with making it happen itself is not what stops you. What stops you is the assumption that you will not achieve the obstacle ahead of you. The problem is that you wait for the perfect condition to start. The reality is that the perfect condition almost never comes. The things that get done bring achievement. Things you do not put off. Things you do not wait for the perfect opportunity to start. Things you do when whatever it is comes up. Excuses get you no where in achieving goals. Focus on the reasons you want to make it happen. Sure there will always be challenges. Things you are not comfortable doing. Things that scare you. Sure there will always be certain things you will not be able to achieve. Amen! It feels amazing to hit goals! I hit a major one last week. You gotta just keep trying/ keep pushing on! Absolutely! Action precedes motivation. And failure just means you're one step closer to success. I love your attitude and love these posts! I love this post!! I couldn't agree more - it is so easy to dissuade yourself from doing something if you think you have a chance to fail. I find that holding me back constantly, it's hard to let go though. It's funny how I absolutely love dandelion seeds and making wishes.. but I hate dandelion flowers ha ha! Oh girl! I love this. So true! couldn't agree more! 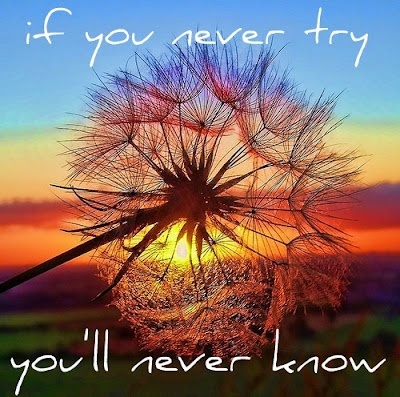 if we never try, we will never succeed. even if our goals are not met with the same result we expect, but at least to say we tried, is better than wondering, what if?